The gothic tower dominates the renaissance styled Cathedral of Baeza, a town designated a World Heritage Site in Andalusia, partly for it being the foundation of renaissance architectural styles in Spain. The graceful Cathedral of Baeza, Catedral de Santa Maria, was originally built on the foundations of a moorish mosque. The current cathedral was completed between 1567 and 1593 in part by renowned Spanish renaissance architect Andres de Vandelvira. Fuente de Santa Maria (fountain) and the Cathedral of Baeza in Plaza Santa Maria, Town of Baeza - a UNESCO World Heritage Site, Province of Jaen, Andalusia (Andalucia), Spain, Europe. 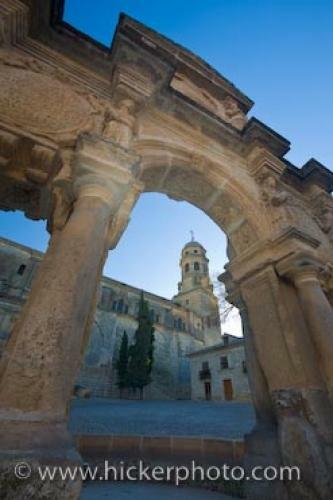 de Santa Maria in the town of Baeza, Andalusia, Spain.